The Aspire V5-531 is the latest laptop manufactured by Acer, finished in plain black and offering a 15.6 inch display, it features a pretty slim profile at just 2.3cm thick. In terms of specification it provides a solid 4GB RAM, 500GB hard drive and a 1.5GHz Intel Pentium processor in the form of the B987 model. Running Windows 8 and weighing 2.3kg, this notebook is functional yet portable - read on for our Acer Aspire V5-531 review. 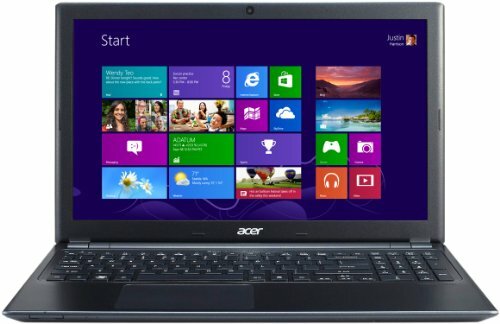 Below is our review of the Acer Aspire V5-531, a 15.6" laptop, featuring 4GB RAM, 500GB hard drive and Windows 8. Finished in a sleek stealth matte black casing, the V5-531 is the latest in Acer's long running Aspire range, offering a fairly generous specification from within it's small body; 4GB RAM, spacious 500GB of storage courtesy of it's 5400rpm hard drive and a copy of the new Windows 8 Operating system. The exterior is fairly non-descript uniform black, broken only by the famous Acer logo on the lid. Black naturally has a slimming effect - however with an overall thickness of a maximum 2.3cm it is indeed incredibly thin for what is essentially a low-ish end notebook. As mentioned previously this laptop features 4GB RAM and Intel's Pentium B987 1.5GHz processor, which is a dual-core chip with 2MB of L3 cache. Storage wise you have the 500GB hard drive, as well as options for external storage in the form of a multi card reader (both SD and MMC) and a single USB 3.0 port, as well as two USB 2.0 ports for slower access. The 15.6 inch HD LCD display operates at a standard resolution of 1366 pixels by 768 pixels, and none of our testers experienced any discomfort, despite testing in a variety of different lit environments. For the money it's not too bad a screen - a crisp picture, with the added bonus of HDMI output should you wish to watch on a larger screen. Battery life was fairly average - around 4 hours - so enough for the majority of commutes and for those who are away from power sources for short periods of time. Acer have provided quite a few options in terms of connections - the aforementioned HDMI, 2-in-1 card reader, three USB ports, two of which are 2.0 and the other being 3.0, a LAN/VGA combination, headphone and microphone 3.5mm jacks, as well as the DVD drive. The keyboard and touch pad are finished in the same neutral black colour, and were both pretty comfortable to use - with the inclusion of a number pad on the right hand side. The touch pad offered a fairly accurate control over proceedings on this notebook - with both buttons being easy and functional to use. So overall what did we make of the Aspire V5-531? Pretty slim in terms of profile, and a decent display, together with a solid specification. If you don't like black, you won't like this laptop! Nothing to complain about overall, it might not stand out, but it functions well. A competitive specification for the money, offering speedy computing whilst out on the move. Extras: DVDSM and integrated graphics card.